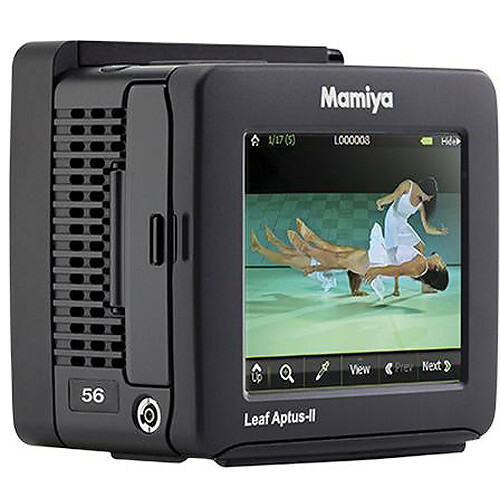 This Mamiya Leaf Aptus-II 10 Digital Back (AFI/HY6) provides 56Mp of resolution from a 56 x 36mm CCD image sensor with 9334 x 6000 pixels. Perhaps more impressive, however, is the collaboration that brought this back to fruition. Mamiya, Leaf, Phase One, and Schneider all came together to create one of the world's most sensitive and formidable imaging devices. The monster sensor, with its 16 bit color palette sends garden-variety DSLRs running scared, with image quality that's beyond phenomenal. The Leaf Aptus-II 10 features the Leaf MOS file format, compatible with Phase One Capture One, Leaf Capture, Adobe Lightroom, and Adobe Photoshop / Adobe Camera RAW. The MOS file sizes are 115MB for RAW uncompressed and 78MB for RAW compressed. The back also provides an ISO sensitivity of 80-800, a 12 f/stop dynamic range, and 1/10,000 - 32 second exposure time. A 3.5" touch screen LCD provides state-of-the-art navigation and composition, if you so choose, along with a preview of up to 20 images and 1:1 zoom. Tools, such as the histogram, exposure alarms, average exposure meter, and the spot meter are also displayed on the screen. Various image settings, multiple language support, CF card and high volume portable FireWire disk storage, and FireWire 800 connectivity round out the in-camera feature set on this 56Mp power house. When it comes to software, the back works with the multiple aforementioned choices. Phase One Capture One and Leaf Capture come included with the Leaf Aptus-II 10, both ready for professional tethered use and RAW file post-processing. Phase One Capture One 6 is a RAW converter and image editing software that both streamlines workflow during and after shooting. Leaf Capture is user-friendly with an upgraded GUI for the Leaf Aptus-II series. It's also the fastest tethered application for commercial shooting. Along with the new GUI this software includes Lens Calibration files. The software can also be used with the new Leaf Remote Capture app for the iPhone and iPod touch. Featuring a 56 megapixel sensor precision-matched with the world's greatest optics results in exquisitely detailed image files, even when tightly cropped. The large sensor coupled with a lush 16 bit/channel color palette, provides exceptional color accuracy and rich high dynamic range photographs in just a single capture. Other digital camera backs or 35mm-sized DSLRs simply cannot compare! Different shooting situations require different photographic tools, especially when it comes to software. Choosing software that you are comfortable using is paramount. This is why Phase One Capture One and Leaf Capture, which are two of the most powerful solutions for tethered shooting and RAW file post-processing, are included with all Mamiya Camera Kits and Mamiya/Leaf Digital Backs. Capture One 6 is a professional RAW converter and image editing software that gives photographers the ability to reduce the time and effort required to deliver stunning, ready-to-use images that possess excellent color and detail. The latest Leaf Capture software has been specifically designed to maximize productivity. It provides an intuitive, user-friendly, and upgraded GUI to all models in the Leaf Aptus-II series. Leaf Capture is the fastest tethered workflow application for commercial shooting. It's ideal for high-volume productions on tight deadlines, such as fashion shoots and catalog work. In addition to the new GUI, the software includes Lens Calibration files, now available while shooting to CF cards, to fix effects like lens fall-off and color cast, which can appear when shooting with wide-angle lenses. Exterior shooting is now much more enjoyable through improved visibility in high glare and reflection situations. Accelerated start-up time by up to 50% (via Firmware update), and speed-up zoom by up to 30% are among many new features. With the addition of the new Leaf Remote Capture app for the Apple iPhone and iPod Touch, the Leaf Capture Suite is the professional photographer's ideal tool to quickly and easily move from image capture to print.